I can not get enough of these Ham Puffs. They are CRAZY good!!! 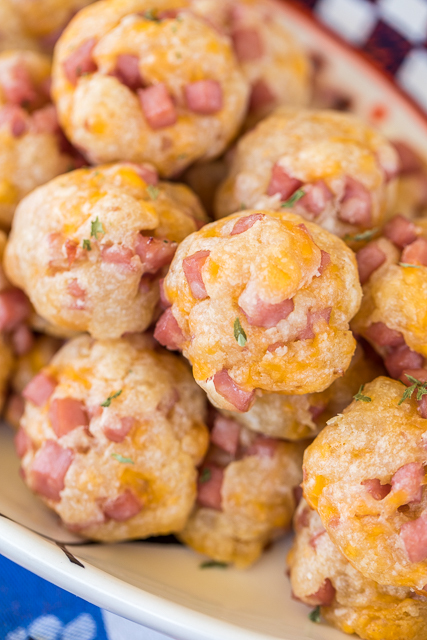 There are only 5 simple ingredients in these Ham Puffs, but they make a delicious treat. I ate WAY too many of these puffs. I just kept popping them in my mouth. I couldn't stop! They are surprisingly good. This recipe makes about three dozen Ham Puffs. 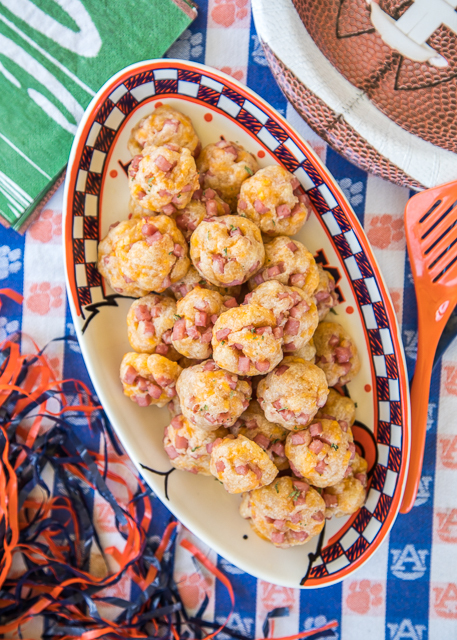 Perfect for holiday parties, holiday snacking and tailgating. They only take about 5 minutes to whip together and they are ready to eat in 15 minutes. They taste great hot out of the oven or cooled to room temperature. I am making a batch of these for Christmas snacking. 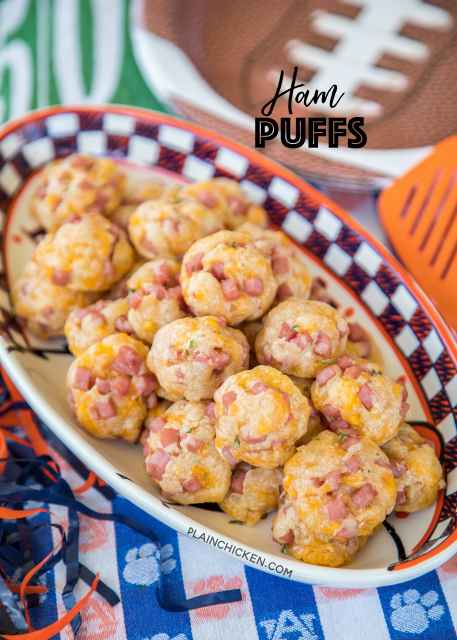 These Ham Puffs are a good alternative to our usual sausage balls! Preheat oven to 350ºF. Line baking sheet with parchment paper. Set aside. In a bowl, combine butter, cheese, ham and Worcestershire sauce. Mix well. Blend in flour. Make sure flour is throughly combined with butter and cheese mixture. Form dough into 1/2-inch balls. Place on baking sheet. Quick question. Are these really rolled into half inch balls? That seems really tiny. These sound delicious and I can't wait to try them. Thanks! Yes - they were small. You can make them bigger if you wish. They might just take a little longer to bake. No to skipping the butter. It is what makes the puff dough. I made those yesterday evening (Christmas Eve). They were the BombDiggity!!! I didn't have my Worcestershire Sauce so I used a few dashes of Louisiana hot Sauce. I had to improvise and they were delicious. Thank You, Much love, Carla Oh yeah, the BBQ-Smothered Green Beans are in the oven now! These sound like a great way to use up some left over Christmas ham!! oh and War Eagle! Perfect for leftover ham!! I just portioned all my ham up in freezer bags. War Eagle!! Could these be made then frozen before baking? So delicious and a nice change from sausage balls! I made 25 out of my batch and total cook time was 23 minutes. Thank you Stephanie! So glad you enjoyed them!!! Thanks for letting everyone know how many you made and the cook time!! I wonder if you could make them using Almond flour to make it low carb? Made those ham n cheese puffs and turned out like eating a flour ball,followed recipe excactly. What did I do wrong? No idea. I make these all the time and they taste great! I've never had anyone say it was a flour ball as that isn't even the dominant ingredient. It just binds everything together. Could it have been my baking time? Made 25 puffs 1" dia baked 25 mins til golden brown on bottom.